NYC, 02/28/2019, 5:30PM. Is Shame Necessary?. Author Reading | Is Shame Necessary? Professor and author Jennifer Jacquet discusses her book, Is Shame Necessary?. "A trenchant case for the use of public shaming as a nonviolent form of resistance, Is Shame Necessary? explores how one of society’s oldest tools can be used to promote large-scale political change and social reform. Examining how we can retrofit the art of shaming for the age of social media, Jennifer Jacquet shows that we can challenge corporations and even governments to change policies and behaviors that are detrimental to the environment. Urgent and illuminating, Is Shame Necessary? 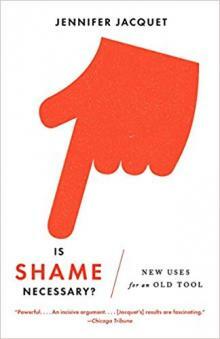 offers an entirely new understanding of how shame, when applied in the right way and at the right time, has the capacity to keep us from failing our planet and, ultimately, from failing ourselves."